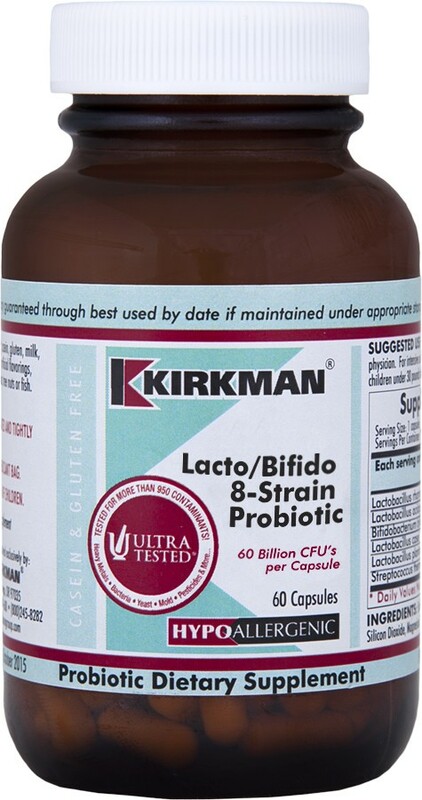 Kirkman's Lacto/Bifido 8-Strain Probiotic (0465-060) offers broad-spectrum gastrointestinal support with 60 billion colony forming units of beneficial bacteria. The most important bacteria for gastrointestinal health are members of one of two genera: Lactobacillus and Bifidobacterium. Of the two, Lactobacillus is the more commonly available commercially. It occurs naturally in yoghurt and various fermented foods such as sauerkraut. There are more than 50 known species of Lactobacillus. Lactobacilli predominantly reside in the small intestine. Bifidobacterium, though also important to adult gastrointestinal health, is particularly important in children. Like Lactobacillus, it also naturally occurs in certain dairy products — several species having been found in various raw milk cheeses. So far, there are more than 30 species that have been discovered. Bifidobacteria predominantly reside in the large intestine. Bifidobacterium breve - 5 billion CFUs. *This product contains two different Bifidobacterium lactis strains.